One of the many ingenious features of the Lazard’s Levelized Cost of Storage (LCOS) analysis is the ability to stack use cases. Stacked use cases capture multiple sources of value from a single installation. The total of all the potential value streams available for a given system defines the maximum, economically viable cost of the system; therefore, stacking value streams and use cases offer the greatest opportunity to maximize return. Use cases focus on the user’s needs rather than the storage system, so by stacking all of the use cases into one stacked use case, a single system can be installed to perform all of the necessary actions. Having a single storage system that can cover all of the requirements in each unique circumstance is both easier to manage and install and also more cost efficient in the long run. 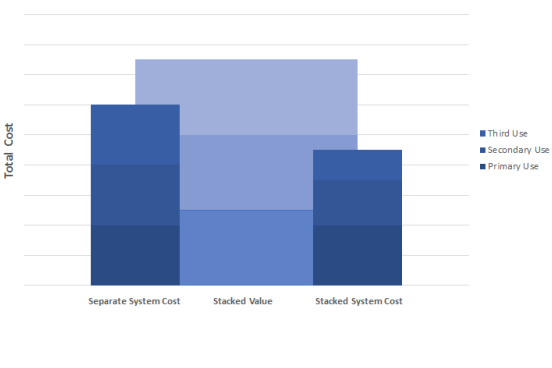 Stacked use case: commercial and industrial → The graphic visually shows the example of the stacked use case along with economies of scale, compared to cumulative system cost. You get the same value of each use case and of the system as a whole for a portion of the cost (seen in picture).